Corvental D There are 3 products. What are Corvental D capsules? Corvental D contains a medicine called theophylline. 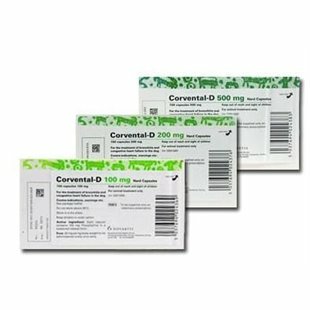 Corvental D is available as 100 mg, 200 mg or 500 mg capsules. Corvental is often used for the treatment of bronchitis and congestive heart failure in the dog. This medicine is only available on prescription, issued by your vet. This prescription will need to be examined by the online pet pharmacy prior to dispatch of the medication. What are Corvental D tablets used for? Corvental capsules are prescribed for the treatment of congestive heart failure and for chronic bronchitis in dogs. Congestive heart failure occurs when the heart begins to fail and fluid can then start to accumulate inside the chest or within the abdomen. Common symptoms include reluctance to exercise, lethargy and depression, increased breathing effort and rate, coughing and occasional episodes of collapse or fainting. When your dog is examined by the vet, they may notice an increased heart rate, a heart murmur, pale gums and weak pulses. Other diagnostic tests such as blood tests, chest XRAYs, ECG and ultrasound scan of the heart may need to be performed. The other main condition that corvental D is often prescribed for is chronic bronchitis. This condition typically affects older dogs. Often, affected animals will cough and can show increased respiratory effort due to inflammed and constricted airways. Corvental for dogs causes the airways to dilate and relax (bronchodilation) and often leads to an immediate improvement in breathing. How is Corvental D given?